And there’s no two ways about it, with every disruptive technology there is always some level of job loss, but the good news is that it also opens up a lot of possibilities and entirely new lines of work, in fact there’s plenty of evidence to show that AI is already generating new jobs. What’s more, generally speaking, people’s core fear is about a robot replacing them entirely, which is based on technology that doesn’t yet exist (general AI). AI today, in most cases, is linked to optimising processes and automating repetitive tasks, freeing up time for humans to carry out more important tasks or helping them process large amounts of data for better decision-making. Complementing rather than replacing. AI has also helped automate many customer service processes and enabled companies to deliver an increasing level of self-service to their customers, which in theory improves customer experience whilst saving costs. And it’s true, in a lot of ways, AI and automation have enabled customers to speed up certain processes or get their issues resolved in a much quicker way. However, I think all of us can think of a time where a self-service tool or a chatbot totally failed us (I’m looking at you “Hey I’m not smart enough to answer your question” chatbots). So, how far should self-service go? A Zendesk survey revealed that 75% of respondents find self-service a convenient way to address customer service issues, and that a whopping 91% said they would use some sort of knowledge base or self-service if it was available and tailored to their needs. This is in line with what we know from a majority of visitors that, for example, prefer entering a website to chat with customer service rather than calling or emailing them. There’s no doubt about it, as modern, impatient customers, we are eager for quick, easy-to-access answers, and self-service is the obvious solution to this, when done right. More often than not, this happens when automation and the human touch work hand-in-hand. Every day we see more and more examples of companies implementing AI or other technologies to improve service efficiency and customer experience (read our blog post on how to get started), but it’s important to remember that in most cases, self-service technology is not advanced enough to entirely replace the human agents. The market for AI chatbots or website chatbots is undoubtedly growing - in a recent Gartner survey, while only 4% of respondents had full-blown tested conversational interfaces, 38% stated that they were planning to do so or already actively experimenting. Unfortunately, with the renewed chatbot hype, we have seen one too many cases where companies release chatbots onto their websites without any back-up plan. The expectation here is that the chatbot will handle all requests, massively decrease costs and somehow deliver an improved customer service. This is never the case. We have quite a lot of experience in online engagement, from live chat to AI visitor targeting, we help our customers boost their customer service capabilities and convert their hard-earned website visitors. As part of this, we also work as a chatbot platform, in other words, we have various bot provider partners and we build the perfect playground for bots to operate in. Having helped numerous companies through chatbot implementations, we can safely say that any form of chatbot or AI-chat self-service initiative should always be used as a complement to humans. The tech has the capability to speed up tasks, save time and as such deliver customer experience improvements, but these tools are never independent from humans. Always have a backup plan - What happens when visitors are asking questions that the chatbot can’t answer? Visitors get frustrated, they don’t receive the help they expected, the customer experience becomes negative. You should always have customer service agents ready to jump in when the request outsmarts the bot. Free up agent resource for the complex cases- Since chatbots can usually handle the simple and frequently asked questions within a blink of an eye, the inbound traffic that needs more advanced assistance will get personalised help much faster, a win-win for the customer and you as a company. Identify and engage - With an AI-powered chat, you can identify those visitors that are more likely to buy and engage in a more targeted, better way. And even after the conversation has started, the relevant team can take over and progress it. This means more meaningful interactions with a lot less time and effort. Customer experience improves when the visitor gets the service they expected or better than expected. Seamless customer service can be easily achieved by successfully combining AI with the human touch. 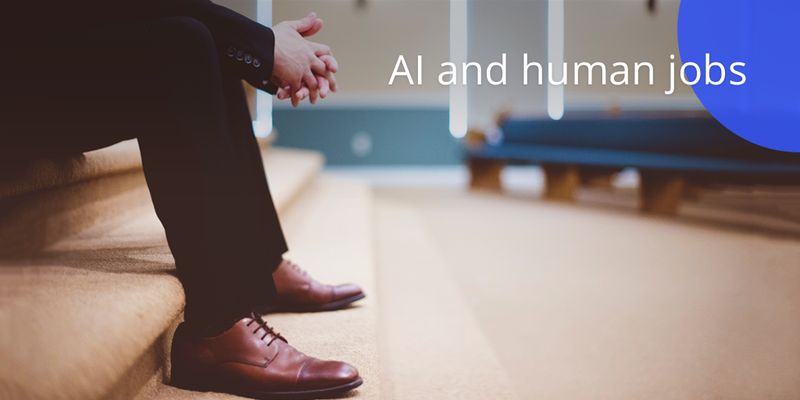 All in all, we don’t think people should be scared of AI replacing them. While it is certainly a contributor to the self-service trend and we advocate for it’s adoption to deliver better online interactions, here at giosg we firmly believe that the best results come from a combination of AI and humans. Remember AI has been developed to help us humans be better, faster, more efficient. Read our whitepaper to find out more about AI and how it could be used: Demystifying AI - The basics of artificial intelligence and a simple guide to getting started!